Aim: The present study highlights the research explorations carried out on process parameter optimization for the formulation of a new growth medium for mixotrophic cultivation of a novel algal strain, ‘Chlorella sorokiniana TERI-A’. Method: Acid-treated Sorghum stover biomass hydrolysate (Sorghum stover prehydrolysate) was used as carbon source that was composed of 22.2 g L-1 total sugar (with 15 g L-1 xylose & arabinose), 16 g L-1 of acetic acid along with small amount of succinic acid, formic acid along with furfural, and Hydroxyl Methyl Furfural (HMF). 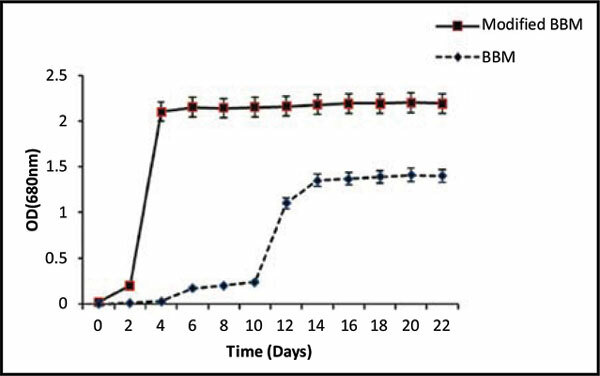 Sorghum stover prehydrolysate concentration (Substrate) was optimized for the enhancement of biomass productivity of TERI-A strain in mixotrophic growth mode. Results: At optimum temperature; 28°C, initial pH; 7.8 and 180 rpm, biomass productivity of TERI-A strain was 2.35 g L-1. C5 sugar concentration of this Sorghum stover prehydrolysate based growth medium was; 1.5%. FAME profile analysis of ‘TERI-A’ biomass revealed that ‘TERI-A’ strain could accumulate 68.2% unsaturated fatty acid. This indicates that this algal strain has potential application in biodiesel production. Conclusion: Carrying forward these research explorations, scale-up of mixotrophic cultivation of ‘TERI-A’ strain was standardized in 3.7 L scale photobioreactor to further enhance the biomass productivity from Sorghum stover prehydrolysate. This is the first report for mixotrophic cultivation of Chlorella sorokiniana in sorghum stover prehydrolysate. Keywords: Sorghum stover, acid hydrolysis, Pre Treatment Liquor (PTL), Chlorella sorokiniana TERIA, FAME, photo bioreactor. Keywords:Sorghum stover, acid hydrolysis, Pre Treatment Liquor (PTL), Chlorella sorokiniana TERIA, FAME, photo bioreactor. Abstract:Aim: The present study highlights the research explorations carried out on process parameter optimization for the formulation of a new growth medium for mixotrophic cultivation of a novel algal strain, ‘Chlorella sorokiniana TERI-A’.